Five years ago I bought my Washington cabin. 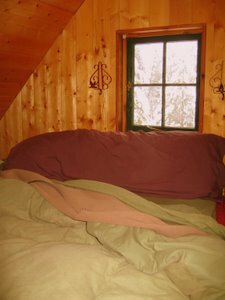 My cabin came with a mattress up in the loft, and since I had a mattress I thought I should cover it with something. I was at my sisters and she gleefully produced an ad for a Mervyns white sale and a coupon for 20 percent off at Bed, Bath, and Beyond. And that is how I came to enter a mall for the first time in 15-20 years. And how I came to own bedding. I bought a set of jersey sheets, a fleece blanket and a cheap down comforter. Even though I’m an active sleeper, all my bedding stays in place and my bed is still made when I wake up. I think it’s because the jersey sheets stretch when you pull on them instead of coming undone. Also they aren’t slippery so the blankets stay put. They’re also warm and feel good. They’re not expensive—I paid less than 20.00 for a top sheet, bottom sheet and 2 pillow cases. Did you sell your other cabin when you bought the Washington one? No, I have two cabins. At first it was fun having two cabins but then I realized it’s just more stuff to take care of. So I’m selling the BC cabin.